Today's Image of Mars once again shows Iani Chaos, but this time we can see all the intricate features created by the massive amount of water that once passed through the area. Iani Chaos was the source for the large outflow channel, Ares Valles after geologic faults ruptured an enormous reservoir of ground water, causing it to flood the surface. Two Mars orbiters (Mars Global Surveyor and Mars Express) have found mineralogical evidence that there was once an abundance of water in Iani Chaos, lending credence to the idea that the features below were formed by water. The two Mars orbiters found hematite and gypsum in the area, two minerals that are only known to be formed in the presence of an abundance of water. But how did all these features form? Looking at the image you can see many web-like features created by what look like inverted riverbeds. Once active rivers on Mars deposited sediments, which were more wear-resistant than the surrounding terrain. When Mars dried up these sediments remained. 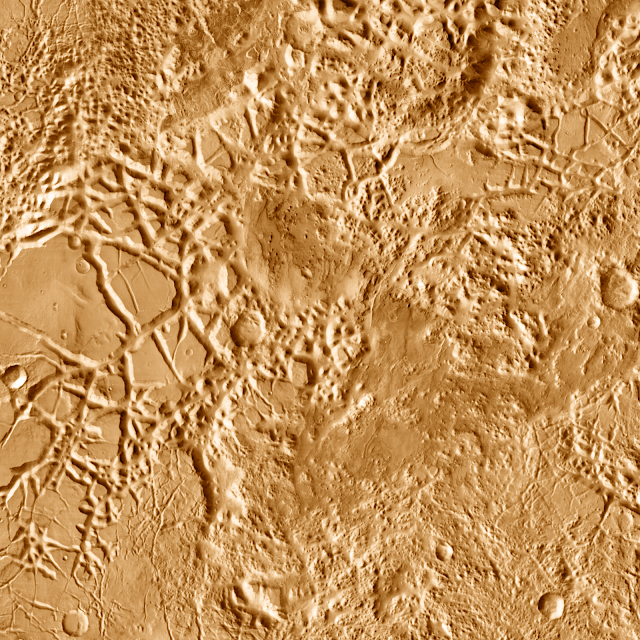 Over billions of years the wind on Mars eroded the landscape, but the hardened sediments were harder than the surrounding terrain so they became less eroded, thus the reason you see this web of features. But where did these rivers come from? When geologic faults ruptured an underground reservoir, millions of tons water poured out onto the surface. The water took the easiest way out, following natural features and creating what we see here today. You can see in the bottom right of this image that the terrain is about as high as the inverted riverbeds we see elsewhere. I think we can safely assume from this that there was an enormous presence of water at the bottom right of this image, which drained through the interlocking riverbeds we see below. While this is just an educated guess, these same features are common on Earth, where great lakes and seas have channels and rivers feeding into and out of them.